Michael Weinzettl on Xmas commercials that stood out from this year's crop. The late Walter Lürzer, founder of Archive, used to say that the commercials made especially for Christmas were what invariably triggered his annual Christmas depression. I don't blame him. It takes quite a lot to stomach this onslaught of mush that, come November, greets us every year. So what I've done here is collect a few popular Christmas commercials from all over that (mostly) manage to avoid the pitfalls of sentimentality, so valued by brands and agencies everywhere (to the point where it has become a kind of a competition between agencies who's best at warming the cockles of consumers' hearts). The first on my list is this year's extravaganza for retailer John Lewis, who have quite a reputation to live up to when it comes to much-talked about Christmas fare. It's from the same agency that does the ads for Harvey Nichols, the most recent one of which won no less than the Film Grand Prix for their Xmas commercial from last year and apparently thought they couldn't top this. As a result we don't have a Harvey Nichols spot this year to bring our feet firmly back to the ground. According to the Daily Mail, the UK's second-favorite tabloid newspaper, (a reactionary rag known for "for its unreliability, as well as printing of sensationalist and inaccurate scare stories of science and medical research and of copyright violations" (Wikipedia), the commercial failed to make it under the top ten most popular spots this year. Which may very well have to do with the resurgence of racist tendencies among Brits since Brexit. The fact that the little girl in the commercial is not white caused a whole onslaught of hateful comments on the web. The second spot in my selection comes from the Spanish Lottery, which, through their agency Leo Burnett, Madrid, have started rolling out long-form Christmas ads for quite a few years now. This Christmas they're offering “Danielle,” the tale of an alien who comes to Earth, takes the form of a human. Clocking in at 18 minutes, it may take some time and patience but, as directed by Oscar winner Alejandro Amenábar ("Open your eyes," "The Others" and "The Sea Within me") it's time well-worth spending. Next on my list is a commercial for London's Heathrow airport, a follow-up to last year's Christmas spot, which first introduced an elderly couple of teddy bears. This year we find out how the two met. The spot starts in 1967 with Mr. Bear as a business traveller and the later Mrs. Bear an air hostess. The advert goes on to show how the couple went through a long distance relationship and finally re-unite with their by now large family at Heathrow airport. Apple's Christmas turn, entitled "Sway", seems to have been somewhat influenced by "LaLaLand" and makes for a very pleasant, largely saccharine-free viewing to the strains of “Palace” by Sam Smith. The dancers are a married couple in real life, Lauren Yatango-Grant and Christopher Grant. Apparently, and again according to the Daily-Mail-commissioned study, one of the most popular Christmas spots this season proved to be this film for Aldi. Go figure! German supermarket retailer Penny goes for – what else? – German angst, offering a darker and quite gripping portrait of a mother alienated from her adult daughter. BBC One went to town with a beautifully animated commercial, "The Supporting Act" (actually a mixture of stop motion and CGI animation) that was adored by many yet also provoked its share of hate commentaries on YouTube due the fact that the BBC had the "audacity" to put non-whites – a teenage girl and her single-parenting father – as the spot's protagonists. The follow-up to the Film Epica Grand Prix winner, which came out around the same time last year is for Poland's "largest transaction platform" (a bit like Ebay I suppose). Beautifully made just like its predecessor, it serves up the story of a boy who never leaves the house without his talisman and comes to a surprising – if not entirely convincing – ending. HP have come up with an Amelie-inspired story involving a little girl who fervently wishes for a White Christmas. Finally – perhaps as a palate cleanser – I give you Anomaly, London's Christmas film. Founded just over 10 years ago, Anomaly is a difficult to define, 'new model'​ agency. Driven by a passionate and entrepreneurial culture encompassing a diverse, elastic set of skills, Anomaly has offices in Los Angeles, New York, Toronto, London, Amsterdam and Shanghai. For their Christmas film they have teamed up with actor Patrick Stewart. 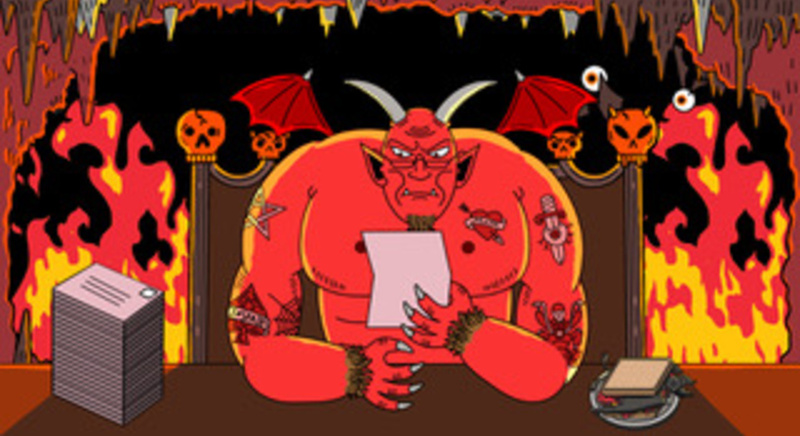 Titled "Dear Satan", it features a little girl named Hope, who accidentally sends her Christmas list to Satan, not Santa. What follows is a journey of self-discovery for Satan, who learns about empathy and compassion. If this synopsis sounds predictably soppy, it is counteracted by torrents of vomit (Satan's) which is certainly a rare occurrence in your average Christmas fare.